When the Federal Reserve hikes interest rates for the first time this recovery – and all signs point to a December liftoff – it will mark the end of the Fed’s easing policy but not the start of tightening. Tightening has been in motion since the Fed ceased its Quantitative Easing program in 2014. Still, many investors fear the Fed will be raising rates too soon despite the fact the stock market historically rallies following interest rate hikes. Of course, the market doesn’t rise because of rate hikes but rather because rate hikes happen when the economy is healthy. If investors’ fears are correct, the Fed’s actions must be out of line with historical decisions. 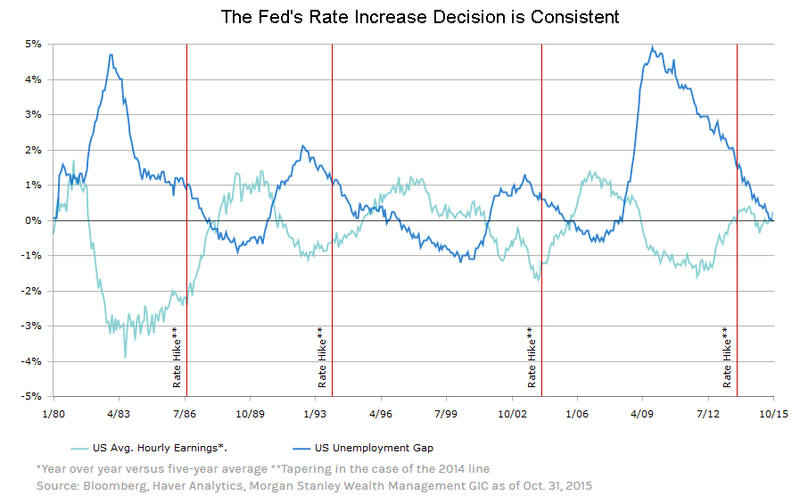 The chart compiled by Morgan Stanley below shows, though the crisis itself and the Fed’s policy response were both unprecedented, the Fed’s decisions have been in line with responses to past recoveries. The blue line on the chart represents the unemployment gap – the difference between current unemployment and full employment in the economy. You can see the timing of the Fed’s initial tightening matches the timing of past cycles as does the time the employment gap took to hit zero following the first tightening. Wages historically take off once the unemployment gap hits zero and, since consumer spending is the main driver behind GDP growth, a spike in wages will be great news for the U.S. economy. GDP growth averaged about 2% since 2014 and consensus expectations are calling for that to continue at a 2-3% clip going forward. 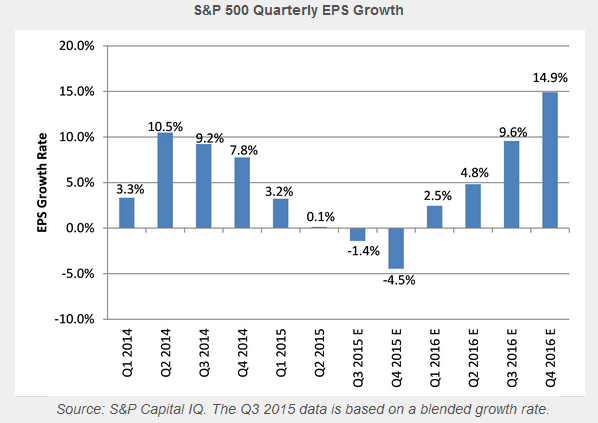 The S&P 500 is projected to post accelerating EPS growth in 2016. There are many factors that affect stock market returns but we continue to believe that a bull doesn’t die in old age. The only thing that can kill it is a looming recession, of which the warning signs are absent. If the past tells us anything, the rate hike is not the end of the bull run but rather a signal of the Fed’s confidence in the economy. Previous Previous post: Is the Stock Market Overvalued?